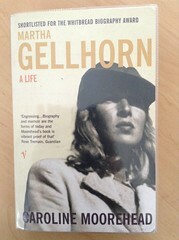 It took me a while to read my way through Caroline Moorehead’s biography of journalist, traveller and writer, Martha Gellhorn. Lots of detail to explore in an eventful life spanning almost 9 decades, ending in her suicide in 1998. Always trying to share the impact of significant events on ordinary people, Martha Gellhorn wrote about the Great Depression in her home country of America, the Spanish Civil War, World War II, the Vietnam War, and much more. Her own life was similarly eventful, living and travelling all around the globe, making friends (and losing them again) across continents.